You are currently browsing the category archive for the ‘Ebeling PR-ize’ category. Insights From Chicago Agency Leaders. From left to right: Chuck Ebeling ’66; seniors Taylor Fisher, Molly Geraghty, Camille Ivy-O’Donnell; Dr. Ron Koperski. Not pictured is senior Morgan Kotars, the winning team’s fourth member. Getting high school seniors interested in voting can be none too easy. But it’s an important task that four Bradley seniors tackled this election year with a public relations campaign that drove home the importance of elections to young voters. The public relation majors—Taylor Fisher, Molly Geraghty, Morgan Kotars and Camille Ivy-O’Donnell—partnered with staff at Peoria Heights High School and Russell’s Cycling and Fitness in Washington, Ill., to organize events for the senior class at the high school on voter literacy and politics. Their campaign, called “Momentum: The Voting Cycle,” hosted speakers at the high school, ran a mock election, created a voting resource website, had the high school seniors teach younger students about voting and ended with a Tour de Vote trivia race, which celebrated the right to vote with activities and physical fitness. Besides increasing voter awareness, their campaign scored another victory when it received the Ebeling PR-ize, awarded to the top senior public relations campaign in the Communication 480 class. The award was established in 2004 by alumnus and Bradley Centurion Chuck Ebeling ’66 and Dr. Ron Koperski, a professor in the Department of Communication, and challenges seniors to design and implement a public relations campaign centered on a key social issue. Dr. Koperski, who taught the capstone public relations course, said students gain valuable experience working as a real-life public relations agency. The semester-long assignment integrates all the skills the students have acquired in their communications curricula and is sponsored Ebeling, who worked in public relations with several major agencies and national corporations before retiring from McDonald’s Corp. as chief spokesman and vice president of corporate communications. 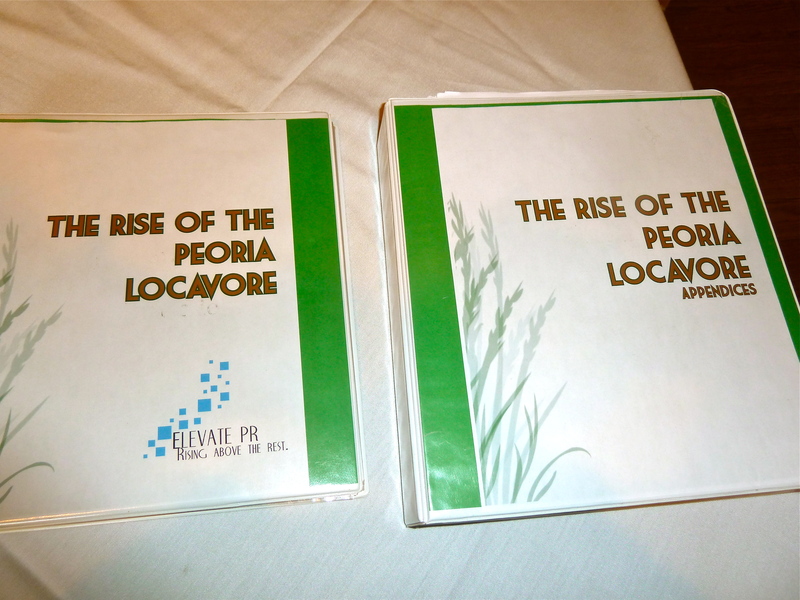 The Rise of the Peoria Locavore? We live in an era where big business may begin to take a backseat to local enterprise, and that is certainly the case wherever farmer’s markets have arisen, bringing fresh, locally-grown produce to the tables of appreciative cooks. A “locavore” is someone who appreciates and purchases such food. It was the “word of the year” in 2007, yet is still being discovered today. The team of senior college public relations majors who won the 17th Ebeling PR-ize for cause-related communications yesterday at Bradley University beat six other excellent teams to win the award, presented at the Mark Twain hotel near Peoria’s famous waterfront, soon to become the home of the #100 million new Peoria Riverfront Museum and the $37 million Catepillar visitor’s center. The PR-ize program, created by Bradley alumni Chuck Ebeling, challenges student teams to bring together all of the PR skills they have learned in a real, pro-bono joint project for the benefit of a local for-profit and a not-for-profit organization, demonstrating that it is possible to do well and do good in our modern society. The student work is on a par with that of a professional public relations agency or department. A creative, six-person student communications campaign to stimulate patronage of local businesses was the winner last night of the 7th annual Ebeling PR-ize for excellence at Loyola University Chicago. Titled, “Unwrap Chicago: Eat, Drink, Buy Local,” the campaign supported small neighborhood businesses. The online program informed the public across Chicago about values at local shops by encouraging people to make a pledge to spend at least $100 with local businesses over the holiday shopping period. 500 people took the pledge, and ABC–TV news covered the event, which included a street rally handing out fliers that looked like $100 bills. The award was made at a gala reception students, faculty and guests in the Advertising and Public Relations curriculum at Loyola’s Water Tower downtown campus. The next Ebeling PR-ize competition will recognize an outstanding team of student communicators from Bradley University at an awards luncheon in Peoria, IL on May 12th. I established this prize program to recognize the high level, pro bono professional communications work that is being done by student teams for the benefit of local businesses and not-for-profit organizations through the outstanding capstone courses in public relations at Loyola and Bradley. The pro-bono “Dare to Be” team became the 16th group of award recipients of the Ebeling PR-ize for cause-related communications at Bradley. The winning team consisted of Jamie Herring of Metamora, IL , Emily Bowe of Cicero, New York, and intriguingly, a male member, Shane Snyder of Edwards, IL. All were graduating seniors in the capstone PR program directed by Dr. Ron Koperski of Bradley’s Slane College of Communications and Fine Arts. The winning team was feted at an awards luncheon hosted by the program creator/sponsor, Charles Ebeling, a 1966 Bradley journalism grad, and the winners each received a letter of commendation and a cash prize. Each semester at Bradley, student “agencies” select a local business and a local not-for-profit and team them in a professional cause-related communications program they create and implement, seeking real, measurable public relations results. Ebeling supports a similar Ebeling PR-ize program recognizing achievement in cause-related communications he created at Loyola University Chicago. The 15th Ebeling PR-ize (copyright Charles Ebeling, 2011) awards at Bradley University for excellence in cause-related public relations were recently presented to a team of four talented graduating senior students. Their winning campaign, for real clients, called “Connect & Protect: Cyber Security for Seniors,” and won in stiff competition among six teams. Each student team selected their own cooperating regional for-profit and not-for-profit organization to bring together in a creative campaign they created, to bring awareness, contributions, volunteers and publicity for a different worthy cause. One.der Communications, as the winning team called themselves, brought together for-profit Web Tech Services, Inc. and not-for-profit RSVP (Retired and Senior Volunteer Program) in a professional-level, well-planned, strategic communications program they created to enhance cyber security training and awareness among Peoria-area senior citizens. The winning team members received letters of commendation and split a cash PR-ize provided by program creator Chuck Ebeling. The winners were feted at an awards luncheon in Peoria, attended by Ebeling and faculty members at Bradley’s Slane College of Communications and Fine Arts, as well as area judges and client representatives. More information on the winning campaign can be found at the website the student team created: SeniorCyberSecurity.com. Chuck Ebeling also sponsors a similar Ebeling PR-ize program at Loyola University, Chicago. Creative Students Claim Ebeling PR-ize at Loyola U.
Tuesday night, about 150 friends of the communications curriculum at Loyola University Chicago’s Water Tower campus gathered for an annual reception and presentation of the 2011 Ebeling PR-ize in cause-related communications. The winning student team produced a creative and effective outreach campaign for the two-year-old Rumble Arts Center in Humboldt Park. The theme they created, “Rumble Arts Center: Your Community Stomping Ground,” carried the flavor of the focus on community involvement of their campaign. Runner Up recognition went to the creative communications campaign developed by a student team for the Bundle of Joy Diaper Bank, Chicago’s first and only diaper bank, serving clients of 11 Chicago food banks. Did you know that food stamps are not good for diapers, the ultimate consumable? Ebeling PR-ize winner announcement at Bradley U. On Friday the 14th, the 13th Ebeling PR-ize winning student team at Bradley University in Peoria, Il was announced. The winning campaign is called Shape Up the Earth, and is a recycling awareness campaign involving the Greater Peoria YMCA and Eagle Enterprises Recycling, Inc.